The monk monastery of Dobruşa is dedicated to Saint Nicholas and is placed in the village with the same name in the raion of Şoldăneşti. The village, placed on the Dobruşa Creek, is mentioned in a document from 1437, a diploma from voivods Iliaş and Ştefan, sons of Alexander the Good. It was founded in 1772 by monk Ioasaf, who came from the monastery of Probota. In 1959 the monastery was closed, its buildings housing a boarding school and some warehouses. 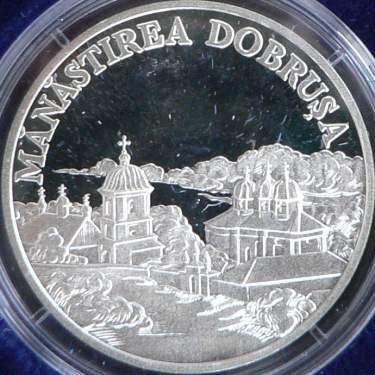 The monastery was reopened in 1993, the two churches (represented on the coin) being repaired. 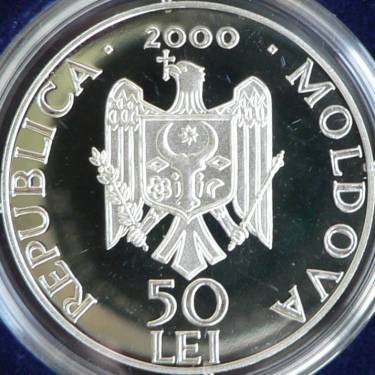 It is placed in the raion of Şoldăneti (former county of Soroca), near Rîul Negru (Black River). It was founded in 1786 by Maria Tocanos, descendant of a yeoman family from the village of Cotiujeni. She took the veil under the name of Mitrodora. The church of the Dormition of Virgin Mary was founded in 1841 by archimandrite Nicandru, confessor at the Clergimen' House (Casa arhierească) in Chişinău, and by his sister, Irina. 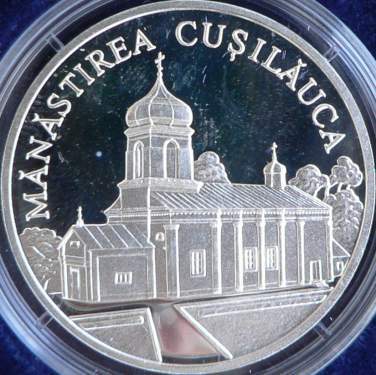 The church was constructed in neo classical Russian style, and it is the one represented on the coin. Another church of the monastery is dedicated to the Saint Emperors Constantine and Helene. The monastery was closed in 1961 and reopened after the fall of USSR.